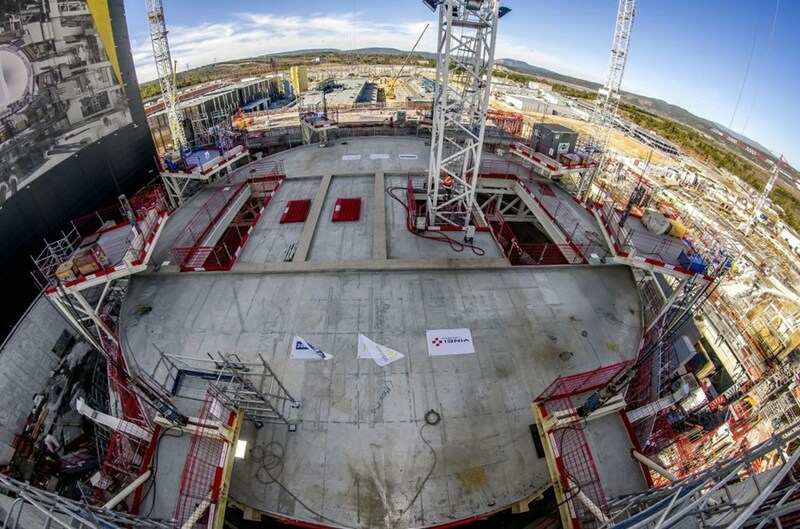 In August of last year, a circular platform—the "lid"—was installed deep inside of the ITER bioshield, effectively splitting the well-shaped work area into two. The 140-tonne steel structure was designed to protect the workers active in the basement levels while offering storage for the activities underway on the four above-ground levels. 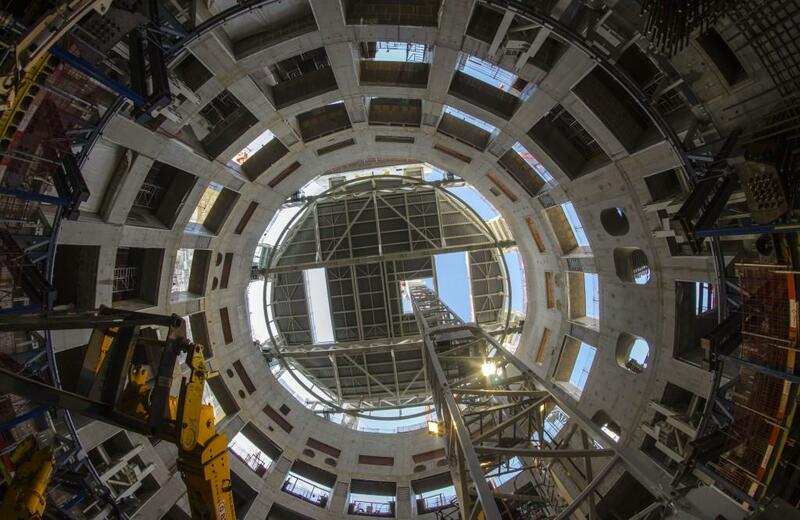 It took three hours for the eight hydraulic jacks, positioned on platforms anchored to the bioshield wall, to pull the 140-tonne ''lid'' to the top of the massive concrete structure. 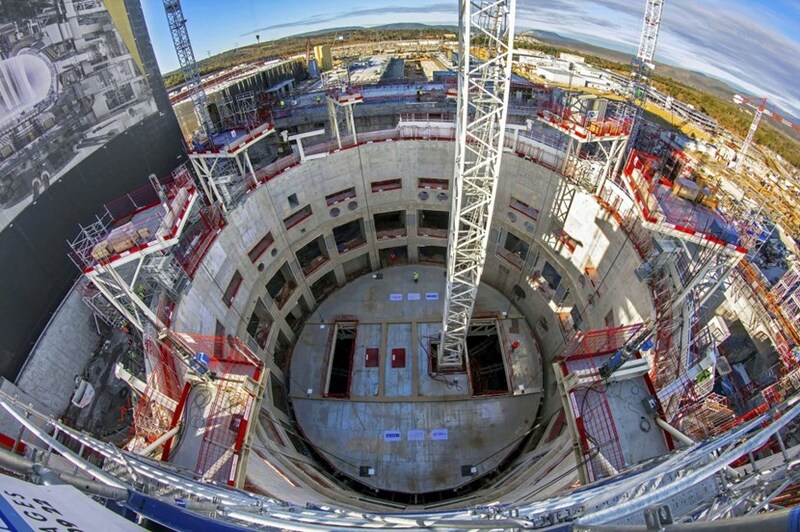 Now, as teams are preparing for the pouring of the concrete crown and buttressing walls at the lowest level of the Tokamak assembly arena, it was time to hoist the lid some 20 metres to the very top. The same technique that was used in September 2015 to lift the 800-tonne roof of the Assembly Hall was implemented last Friday 9 March to raise the structure centimetre by centimetre, carefully maintaining its perfectly horizontal position. The ''lid'' will remain in its present position until April 2020 when it will be removed to allow components into the assembly pit. Eight hydraulic jacks—positioned on sturdy platforms distributed around the top of the bioshield—slowly pulled on cables that were attached to the lid in an operation lasting three hours. The bioshield's new "roof" will remain in its present position until April 2020, when the lid will be removed in preparation for the first components to be delivered for installation by the overhead handling cranes. Click here to read a related report on the European Domestic Agency website. 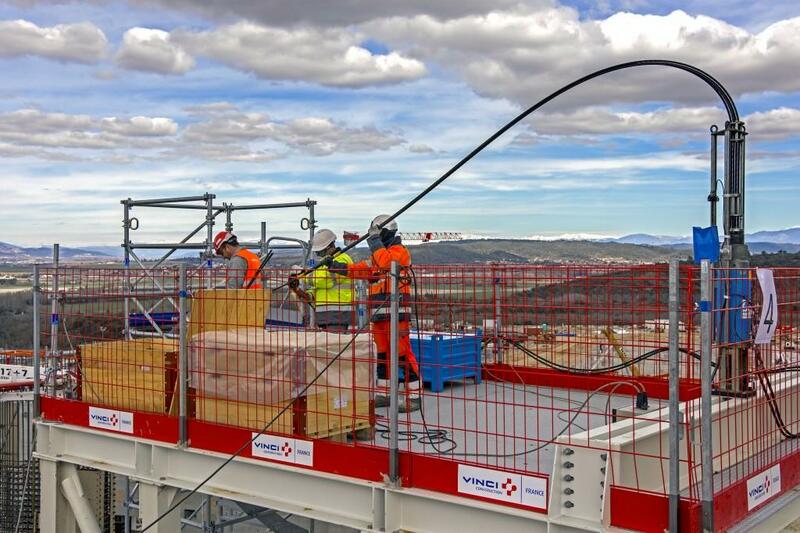 Using the same technique that was implemented to lift the 800-tonne roof of the Assembly Hall two and a half years ago, experts from VSL Heavy Lifting completed the operation in three hours. A steel rim still needs be added to fill in the gap around the lid, bringing the total weight of the structure to approximately 200 tonnes. 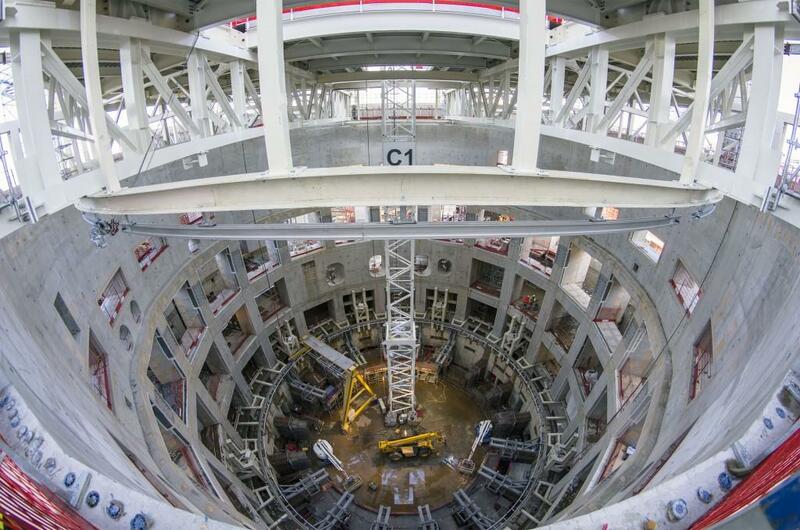 The circular gantry crane (in yellow) presently located on the floor of the Tokamak Building will be made taller by one metre in order to handle the installation of the first magnet feedthrough (a component that transports cryogens and electrical power to the magnets). 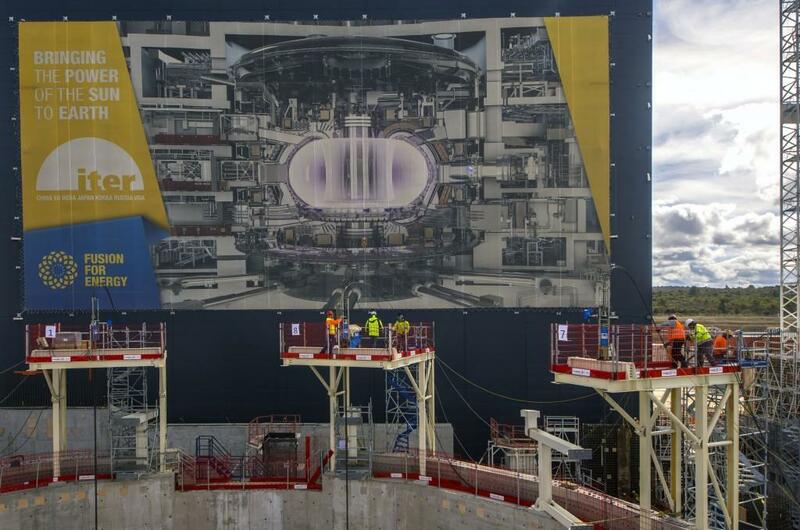 Specifically, the cryostat feedthrough for poloidal field coil #4 is a massive "captive component" bent at a 90° angle that must be installed later this year between two of the radial walls visible in the photo. Approximately the size and bulk of an average man, hydraulic jacks are extremely powerful devices. 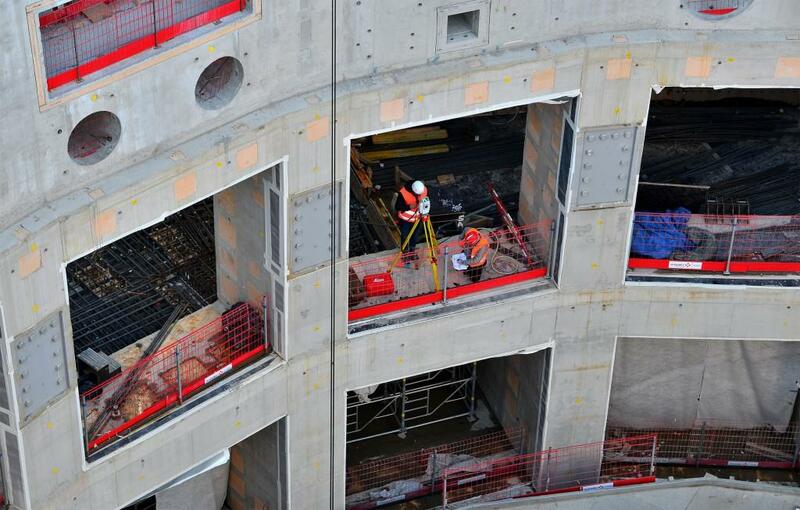 On 9 March the hoisting job was performed by only eight jacks, pulling on cables attached to the 140-tonne lid. Before allowing the eight hydraulic jacks to begin pulling, operators performed laser measurements to verify that the lid was in a perfectly horizontal position. If for any reason one jack failed, the lid would not tilt more than one millimetre. Each hydraulic jack is connected to the lid by a bundle of four cables. During the lift operation, the single-use cables are cut in sections a few metres long as they exit the jack.